As the principal planner and lead designer at SBM event co. I fully believe that memorable events are not only about what you see, but how they make you feel. My overwhelming commitment for bringing an event to life will be evident from the moment we meet. As the creative force behind each and every celebration, I pride myself on creating cohesive environments that are truly personalized experiences. Combine that with expert logistical planning and you have the best of both worlds from concept to execution. Being an event planner and designer is not for the faint of heart. The high stakes, long hours, high stress, travel, and that darn Murphy's law might have you asking why we do it. Honestly; the joy I receive when a bride walks down the aisle still fills my soul so much that I tear up. Every... darn... time... without fail. If you were to ask me: What keeps you going? 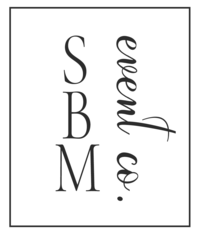 It would be that every day here at SBM event co. we get to help you dream, design, and plan some of life's most cherished events. Being a part of that makes me feel like this is exactly what I am supposed to be doing at any given moment. I can't think of anything better than helping couples, their family, and their friends in creating memories that will last a lifetime. For nearly 15 years, Maureen has planned large corporate galas for theatre companies and organizations for which she sits on the board, along with exciting public events, private parties, and weddings. Combine that experience with her nerdy love of spreadsheets and logistics, along with crafting and DIY projects, she is an invaluable asset to this team. Nikki is a natural caretaker who carries an essence of loving kindness and professionalism. Experienced in the world of event management, she brings a calming presence along with her, as her primary role is Yoga instructor. Nikki is masterful at helping people to fully enjoy the moment, resting assured that details are being tended to with a mindful eye. A graduate of the Hotel School at Cornell University, Katie is passionate about creating memorable moments for the couple and their guests. She relishes in the little details that make an event come together whether it be the placement of a menu just so or the perfect fluff of a bow. Katie is our resident calligrapher, proofreader, and all around organizational genius. Lauren is ambitious, creative and a natural born planner. Lauren joined us from the start and since then, she has proven to be a creative and savvy team member we can call upon for any task. As a “Jane” of all traits you might say there’s nothing she can’t tackle to ensure each event is spectacular from the first impression down to the smallest detail. Cat is a detail oriented team member with strong leadership skills. She is known for handling high pressure situations with grace and ease. She has been with us from the beginning acquiring exceptional organizational and management skills, and a warm, can-do attitude to every event she works on. A graduate of the Fashion Institute of Technology, Kim’s passion for visual aesthetics, fashion, and design aid in her ability to plan and execute immaculate events. Her tireless work ethic, ingenuity, and pursuit of quintessential details are a few of the many qualities that aid in her ability to plan and execute immaculate events.